Hope everyone is doing well and enjoying the New Year…hard to believe it's been almost a month since the holidays!! 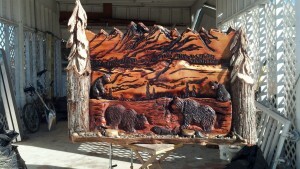 I wanted to show you all the newest piece of work that will be displayed at Knott's Berry Farm's Grizzly Creek Lodge dining facility! We are so excited to have a piece showcased at Knott's!